I know, I know. It is the middle of winter. And we’re about to see some snow in London. I came across a post that remained unpublished since a very hot week last year, after my last supper club for a while. I thought it would make us all feel a bit warmer to think of sun, avos and dancing outdoors. Here it is. Just imagine it’s July and enjoy. What to do with a mountain of avocados before they go off in the middle of a heatwave? Do you like your avocados sweet or savoury? And how do you feed a bunch of people without a kitchen? Last week year I served a Brazilian brunch at the Deptford Brunch club. I took the lack of a proper kitchen as my chance to serve a collection of my favourite Brazilian bar snacks – fishcakes, cheese buns, polenta fries – washed down with passion fruit and coconut cocktails. I also pretended for a day that we’re actually Mexicans in Brazil, and included corn bread topped up with avocado salad in the menu. You see, avocados are not really seen as savoury food in Brazil, but feature heavily in smoothies, desserts, or simply eaten on their own, with big lumps of sugar. Hmm, fat and sugar! The day I found out what you could do with avos, mozzarela and tomatoes, a whole universe of goodness opened up for me. Do not even get me started on guacamole! This time, I had to come up with a non-kitchen menu, on a very hot day, and a cold avocado salad with corn bread seemed ideal. After stocking up at Lewisham market and its bowls of everything for a pound, I fed the 50 guests comfortably, and took a good 20 avos back home. And it has been smoothies and avocados on toast ever since. A week on, and it was last chance for the 10 remaining ones. I went through cupboards and came up with a dessert to use up various half consumed packets of food. 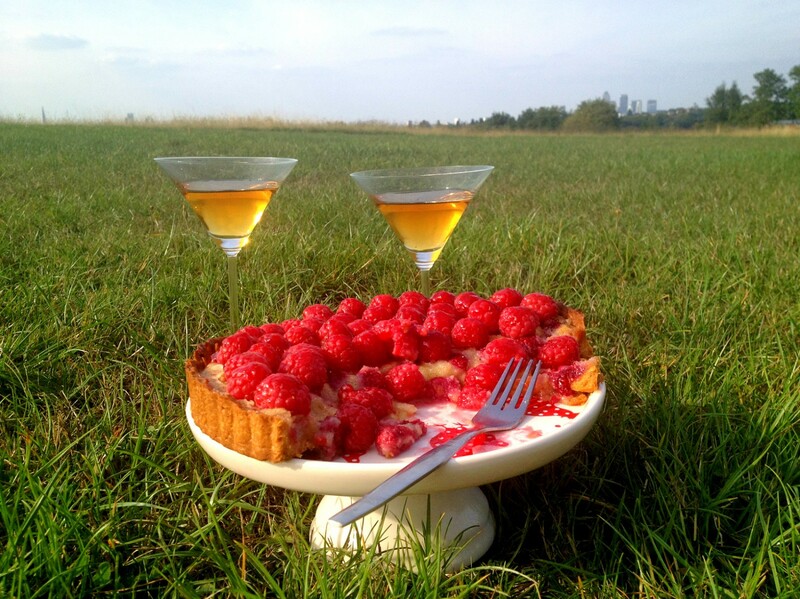 Ideal for the infernal heat that has taken hold of London, this is a non bake tart. The base is like a crunched biscuit cheescake base, but with almonds and pistachios instead. The rich, creamy filling used up 8 avocados, cocoa powder, and some booze to keep it interesting. The same Brazilian cachaca (similar to rum) that went into those cocktails, incidentally. As for cooking outdoors for a large group of people on a boiling hot day, here’s my advice: have the wonderful Lynne, of Haven’t Stopped Dancing Yet fame, play Brazilian music while keeping the cocktails close at hand. You’ll have the time of your life. In a blender, crush the almonds and pistachios. In a bowl, mix the crushed nuts, melted butter and maple syrup. Mix it with your hands and you should end up with the consistency of wet sand. Press the dough into the base of a pie dish. Keep the base in the fridge while you make the filling. In a blender, mix all the ingredients until you have a thick cream. Add more milk or syrup to taste. Pour the filling into the base and keep the tart in the fridge for a couple of hours until it firms up. Serve cold. Thanks, Linda. Shame it disappeared rather quickly.